If you're looking for a fun and unique way to keep the little guests at your child's party entertained, then Fear Factor party games could be just the ticket. These games can be adapted to work for all ages, and kids will love diving in to the ooey, gooey fun. 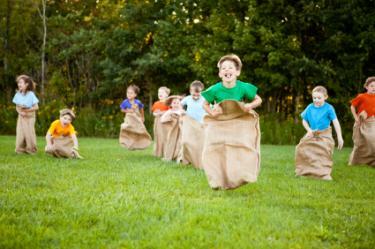 Stunts involving food are the easiest to put together and the friendliest for all age groups. Although contestants on the real Fear Factor show have to choke down things like real bugs, you should use food that isn't scary to eat, but looks like it! To give your party guests a frightfully good time, put some awesome Fear Factor ideas into action. Take a red juice, like strawberry juice, and make it look like blood by adding extra red food coloring. Increase the gross-out factor by making it congeal with a little bit of gelatin; just don't let it set completely. You can also use tomato or V8 juice to look like blood. Fill small clear cups with the beverage and see who is the first to chug it down. Serve gross foods, such as candy insects and worms, and see who is the most daring. You can find an array of gummy treats - even large gummy rats, which are sure to be one of the grossest treats around. Keep in mind that the grosser the better works for this game. 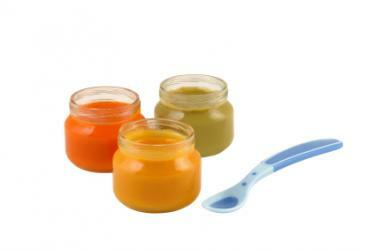 One icky idea is to add a few spoonfuls of unheated hot fudge sauce, baby food or other pureed food to the center of a baby diaper and let kids unwrap and eat. For older kids, fill diapers with a few different kinds of foods and give prizes for correctly guessing what is in the diaper. Kitty Litter: A box of white cake mix and some food coloring can help you churn out a kitty litter cake. Use the food coloring to turn the batter gray and then bake according to package directions. When cooled, reduce the cakes to kitty litter like crumbs - you can even create "clumps" with a little bit of sugary syrup. Pick up a cheap litter tray and tray liner from the store and serve the litter up to your guests in the tray. 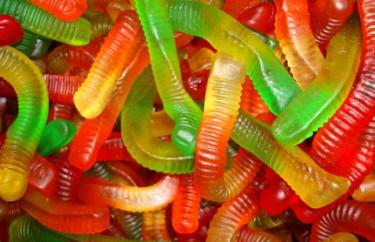 Worms: Fill a bowl of pudding with gummy worms. Blindfold kids and have them dig out a worm and eat it. Of course, for the full effect, don't let them know they're gummy worms! Using a container of Jello, put your hand in to search for an object. This can also be done with pudding. Put in items such as fake fingers, plastic eyeballs, plastic spiders and anything creepy. This old-time party game is just as fun today. 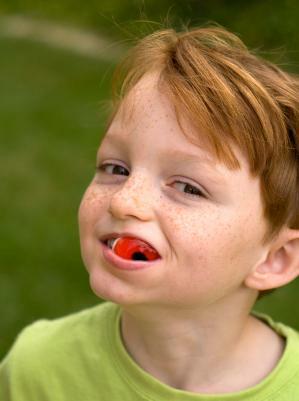 Place apples or whatever objects you like in a tub of water and have the kids use their mouths to pull one out. You may also want to have some small prizes for the winners of your challenges. You can award prizes to winners of each individual challenge, keep track of points for individual challenges and award one grand prize, or do some combination of the two. You can also skip the prizes altogether and simply set up your challenges as stations each child goes through. Fear Factor parties can be tons of fun for everyone involved and ideas for games are nearly limitless. Use your imagination to put more creepy, crawly ideas into action. Always be sure to check with the parents of your guests to get the okay for whatever activities you have planned. Since some of the activities you'll be doing will be food-based, get the all clear on any food allergies before serving up the challenge. Likewise, although you don't want to plan any overtly risky physical stunts, whenever you're playing games that go beyond the old "pin the tail on the donkey" standards, the risk of injury is ratcheted up a little bit. Make sure the parents know what you plan to do in case there any problems down the line.